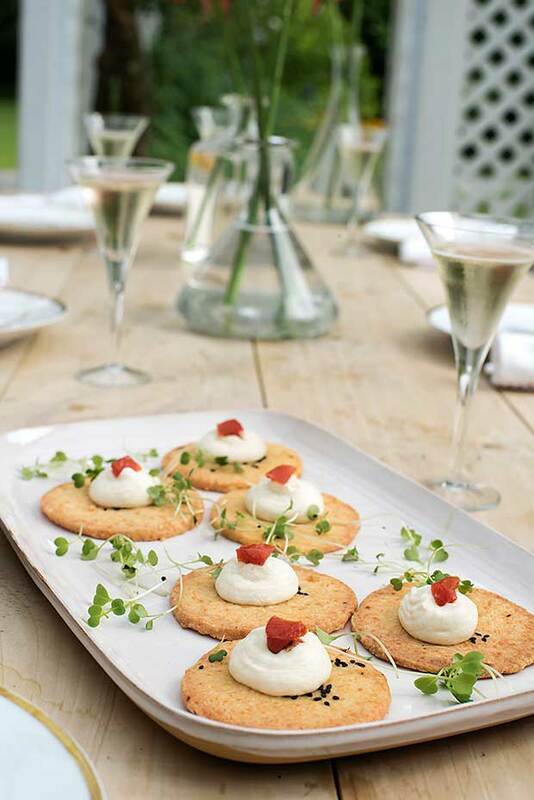 The cauliflower mousse recipe will make more than you need for the shortbread. Use leftover mousse with grilled fish or salmon, in jacket potatoes or with canned tuna in a salad. Preheat the oven to 180°C and line an oven tray with baking paper. Put both flours, salt and chilli flakes into a food processor fitted with a metal blade and process until combined. Add grated cheese and Parmesan and process until cheeses are finely chopped. Add butter and process until mixture resembles coarse breadcrumbs. Drizzle in lemon juice and briefly leave machine to run until dough forms a ball. Lay a large sheet of foil on bench and cover with a sheet of baking paper. Form dough lightly into a ball then roll it into a log about 7.5cm in diameter. Sit it on the baking paper and push it away from you to roll it up in the baking paper. Then roll it back towards you so it is wrapped in foil. Twist ends tightly to end up with a bonbon. Chill log until it is very firm, or freeze until required. If frozen, defrost log for a couple of hours in the fridge before slicing. Slice log into 10 rounds and put them on the prepared tray. Scatter sesame seeds on top and bake shortbread for about 15 minutes or until golden. Leave biscuits on tray for a minute or two then transfer to a rack. Completely cool and store in an airtight container. Bring a pot of water to a boil. Add the cauliflower and the salt and blanch by bringing back to a boil. Drain the cauliflower and refresh under cold running water, then lay florets out to dry on paper towels. Put the dried cauliflower and butter in a high-speed blender and process until smooth. Scrape into a bowl. Place the water in a small bowl and sprinkle with the gelatine. Leave for 5–10 minutes until it turns to ‘sponge’. Put 50ml of the cream in a small bowl and heat in a microwave oven (or in a small pot on the stove) until hot but not boiling. Add the gelatine mixture to the hot cream and stir until dissolved. Cool to room temperature.